Bishop Michael visited Holy Spirit Church in Wantage NJ on Monday morning, 9 June 2014, to celebrate the Divine Liturgy on the patronal feast of the parish. Archpriest Samuel Kedala (parish rector) and parishioners welcomed and greeted visitors from other churches. A festal meal was served in the church hall after the celebration of a spiritually uplifting Liturgy and homily delivered by His Grace. Celebrating the Divine Liturgy along with Bishop Michael were: Archpriest Samuel Kedala; Archpriest Joseph Lickwar (Chancellor of the diocese & Rector of Saint Peter & Paul Church, Jersey City NJ; Protos Corneliu Andrasco (special guest priest from the Patriarchal Cathedral in Bucharest, Romania); and Priest Christos Talleos (Rector, Holy Cross Greek Orthodox Church, Middletown NY & President of Hudson Valley Clergy Association). 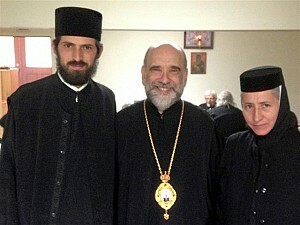 Subdeacon Alexander Vlachos assisted along with Reader Michael Pierce (a student from Saint Tikhon’s Seminary). Also in attendance were: Igumen Joseph (Rector, Holy Transfiguration Church, Pearl River NY); Archpriest Alexis Vinogradov (Rector, Saint Gregory Church, Wappingers Falls NY); and Archpriest Stephen Evanina (New Jersey Deanery secretary & Rector, Holy Assumption Church, Clifton NJ). Mother Mariodora, also from the monastery of the Patriarchal Cathedral in Bucharest, was also an honored guest.